Aerocool ExtremEngine 3T Case - Black - 250mm Fan! Home > Shop By Brand > AeroCool > Aerocool ExtremEngine 3T Case - Black - 250mm Fan! The ExtremEngine 3T from AeroCool gives a new meaning to airflow. With two massively oversized fans, the side panel fan just being obscenely gargantuan, there is never a shortage of heat squelching cool air to keep your system running fast and stable. 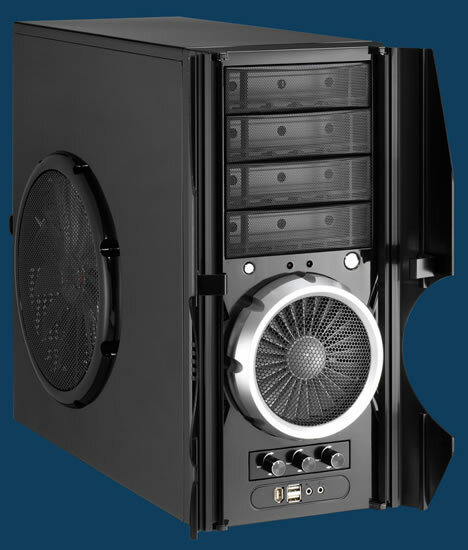 This case features mesh ventilated drive bay covers for further airflow. An elegant 2 piece brushed aluminum front bezel door is designed to turn heads. A built in 3 channel fan controller allows you adjust up to 3 channels of fans for speed and noise reduction. High speed I/O and audio ports are located on the front bezel for your convenience. The name of the game here is airflow, and with a whooping total of 231.19CFM of airflow on the included fans, it is easy to see why the ExtremEngine 3T from AeroCool is the reigning champion! Material: SECC 0.6mm Dimensions: 17.3" x 17" x 8"
External: 4 x 5.25" / 1 x 3.5"